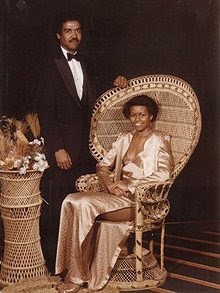 The first boyfriend of Michelle Obama has provided new insights into the First Lady, not to mention a prom night photograph of her in a satin dress with plunging neckline and a high slit. David Upchurch escorted the then 18-year-old Michelle Robinson to the prom at Whitney M Young High School in Chicago in 1982. Now a customer service representative and divorced father of three living in a modest house in Colorado Springs, he said that their romance went nowhere. "I was a screw-up, plain and simple," he told the Enquirer magazine. He claimed he had "pretty much forgotten" their prom date together and couldn't even recall if it ended with a kiss. Mr Upchurch, the first of Mrs Obama's former boyfriends to speak publicly about their relationship, knew her family from an early age as they were both raised in Chicago's South Side. "I grew up with Michelle and her brother Craig. We were neighbors and our families were close." After his father died, Michelle's father, Fraser, took him "under his wing" and helped him to deal with his loss, he said. They "began dating" when Michelle was in the middle of her junior year at high school –when she would have been 16 or 17 – and continued to see each other for a year and a half, until she graduated, he said. "Michelle and I really liked each other, but you know how some high school boys are," he told the magazine. "We're not ready to be responsible and we screw up. I was a screw-up, plain and simple! At that point, I just didn't take my life or my future seriously." "But Michelle knew what she wanted, and after graduation she was off to Princeton. I couldn't stand in her way. I wished the best for Michelle because she's always been a wonderful person." Mrs Obama's siblings have said that their parents taught them to have high standards. Craig Robinson, her brother, has said he used to vet the boys she dated but stressed that she never had too many long-term boyfriends. She met Barack Obama when she was a 25-year-old lawyer at a corporate law firm, having just left Harvard Law School. "I always knew Michelle was special and would make a difference in the world," said Mr Upchurch.